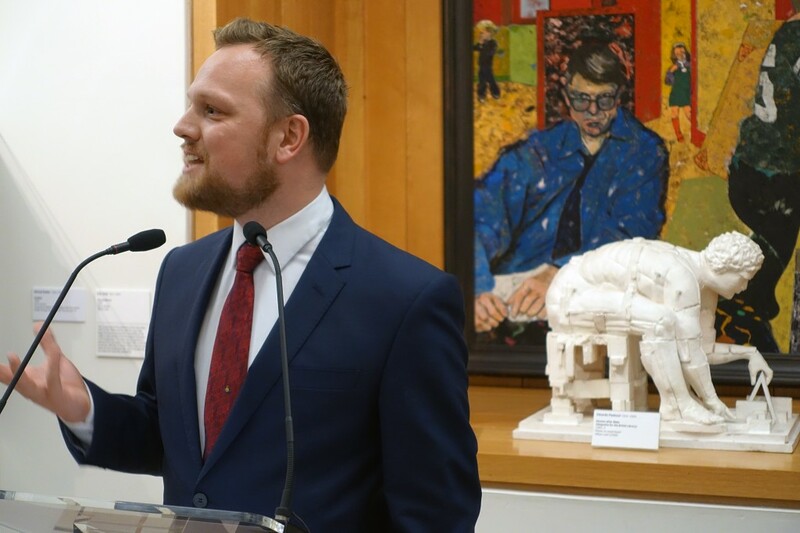 Pallant House Gallery’s Artistic Director, Simon Martin, opened their latest exhibition ‘David Jones: Vision and Memory’ last Friday. 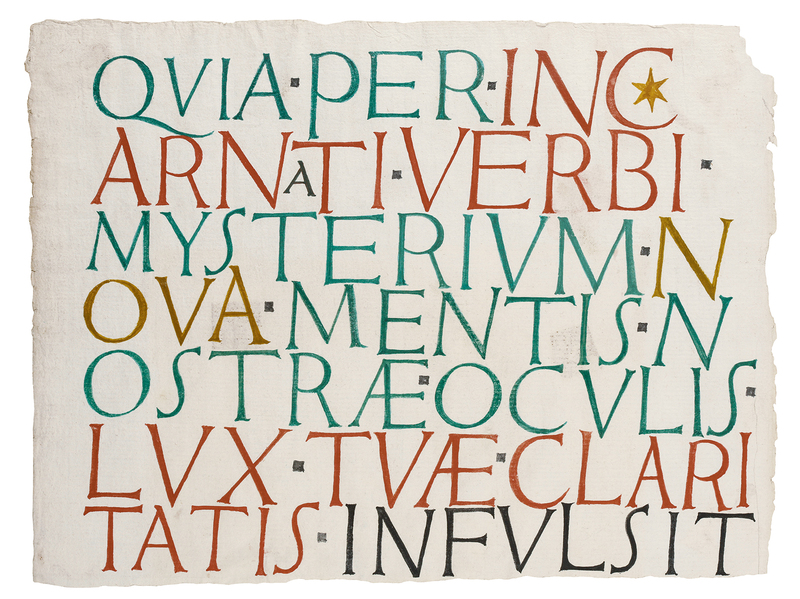 This timely retrospective provides an extraordinary insight into the life and work of this talented British artist who, between 1921 and 1924, was a member of Eric Gill’s Guild of St Joseph and St Dominic in Ditchling, Sussex. 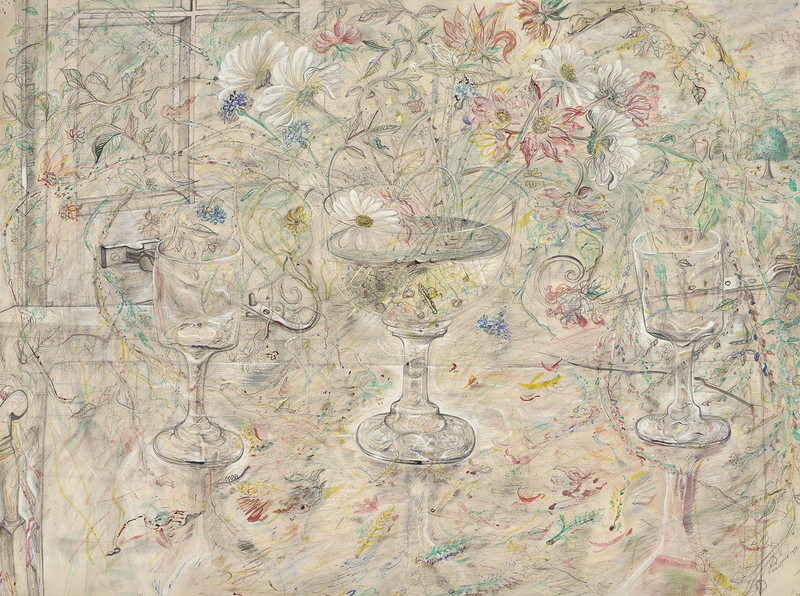 David Jones (1895-1974) worked as a painter, engraver, poet and maker of inscriptions. He responded with a lyrical delight to the visual world around him. But there is also a mystical, timeless quality to his work, rooted in the memory of the long and ancient procession of human history. In 1936 the famous art historian, Kenneth Clark, described him as ‘in many ways, the most gifted of artists of all the young British painters’, adding in the late 1960s that Jones was ‘absolutely unique – a remarkable genius’. My passion for Modern British Art began at Jim Ede’s home, Kettles Yard, in Cambridge. Jim Ede championed many of the leading artists of the 1920s and 1930s whilst an assistant curator at the Tate gallery in London. It was at Kettles Yard, amongst the work of Ben Nicholson, Barbara Hepworth, Henry Moore, Naum Gabo and Henri Gaudier-Brzeska, that I first encountered David Jones’ watercolours and prints. Amongst these was the expressive work ‘Flora in Calix Light’. Jones converted to Roman Catholicism whilst at Ditchling and his faith remained one of the recurrent influences on his art and writing. In the 1950s Jones’ horizons began to come in on him and his attention moved from a delight in the world outside to the interior. The resulting still lifes are considered to be amongst his best works. ‘Flora in Calix Light’ has many of the common themes of these watercolours. The large, central glass goblet resembles the chalice of the Mass. There is an abundance in the garden flowers which fill it. The three glass chalices represent the scene of the crucifixion. They are charged with a translucent light, the white gouache heightening our sense of the luminous. Through the open window we glimpse a tree which reminds the viewer of the cross. This reflective painting captures the mystery of the Passion narratives through its rich symbolism, whilst the Christian iconography is implicit rather than explicit. 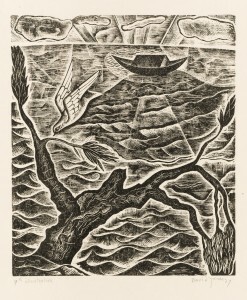 There is a connection with David Jones’ meditation on the unity of all creation in the presence of God, ‘The Anathemata’, which was published in 1952. 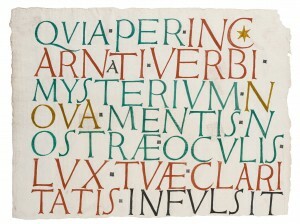 From the 1940s onwards David Jones embarked on a series of painted inscriptions. They are amongst the most beautiful images in this exhibition. Initially he produced them as greetings cards to friends. There is a playful quality to them as the artist wilfully misspells words and mixes languages. But these are meditative pieces which demand the full attention of the viewer. They embody an understanding of the true presence of Jesus Christ in the Mass and as ‘the Word made flesh’ as expressed in ‘Quia Per Incarnati’. 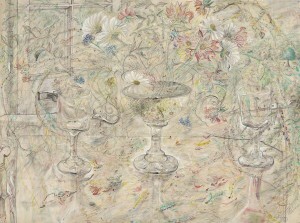 The exhibition illustrates the development of, and influences on, the work of this complex artist in an accessible way. It allows us to see the consistent quality of line apparent throughout David Jones’ career and not least in his earlier wood engraved illustrations like ‘The Dove’. ‘David Jones: Vision and Memory’ will reward you whether you are familiar with the artist’s work or discovering him for the first time. You cannot fail to be delighted by this remarkable modern British artist with such strong links to Sussex. I am pleased that Toovey’s is amongst the headline sponsors of this insightful exhibition which runs until 21st February 2016 at the Pallant House Gallery, 9 North Pallant, Chichester, PO19 1TJ. For more information about the gallery’s current exhibition program go to www.pallant.org.uk or telephone 01243 774557. By Revd. Rupert Toovey. Originally published on 28th October 2015 in the West Sussex Gazette. The thing which never ceases to surprise me about doing business with the Chinese, in mainland China and here in the UK, is the phenomenal speed with which this creative and dynamic nation are adapting and changing in order to do business in the global economy. 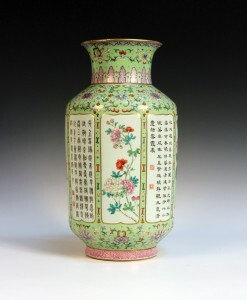 In 2013 Toovey’s, together with a group of the UK’s leading regional auctioneers, formed the Association of Accredited Auctioneers (AAA) and were invited to China to form an exclusive working relationship with Epai Live, China’s largest mainland online auction platform for the marketing of art and antiques. 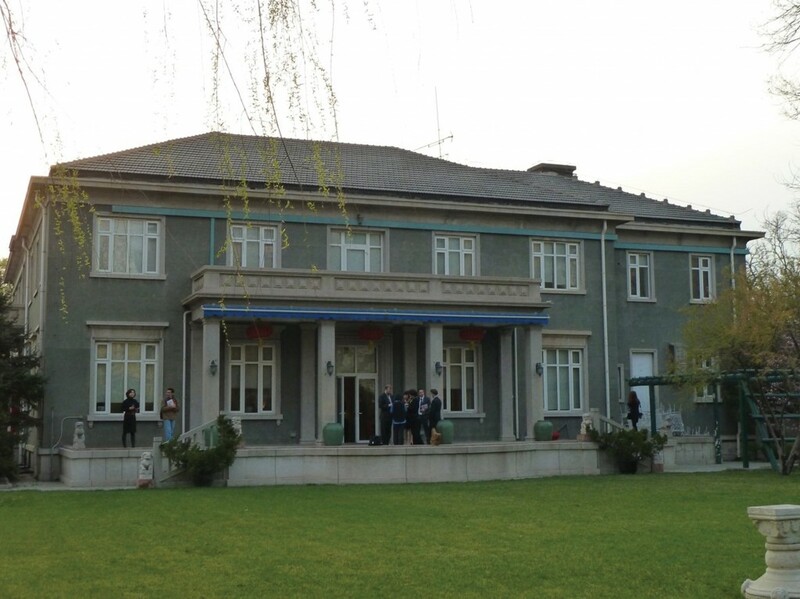 The introduction of British auction practice and ethics was seen as an important part of this relationship in Beijing. 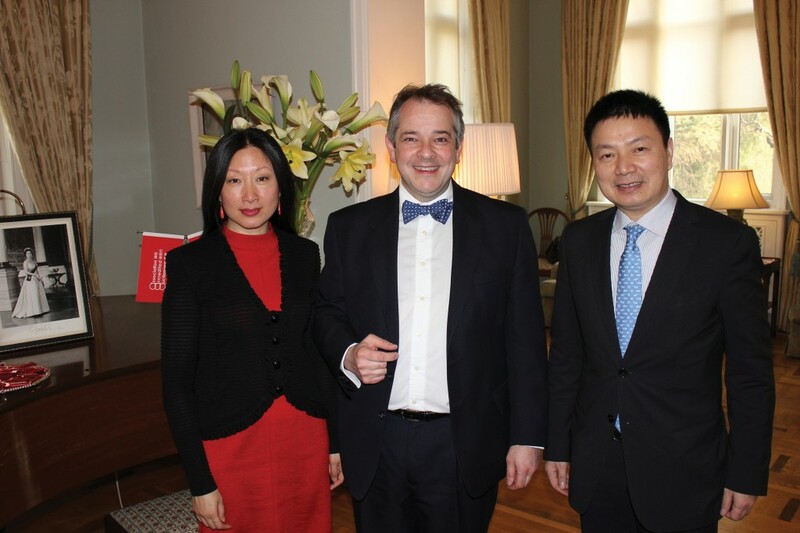 The British Embassy hosted the launch of this agreement which was signed by the Epai Live Chief Executive, Dr Qi Qi Jiang and attracted much attention in the Chinese media. A series of promotional lectures have established relationships with mainland collectors and the emerging aspirational professional class. Working with Epai Live continues to allow Toovey’s to overcome the obstacle of the Chinese internet firewall in order to market directly to Chinese mainland collectors. There have been extraordinary developments in this market with an increasing connoisseurship evident amongst Chinese mainland collectors and specialist dealers. This rapid maturing of this is enormously important to the long term health of this market. The strength of demand has to date shown no signs of abating. Many areas of China’s economic activity appear to be slowing but their desire to acquire Chinese and increasingly European art and antiques remains undiminished – a trend which looks set to continue in this maturing sector of the collectors’ market. Exciting times in this maturing international market! By Revd. Rupert Toovey. Originally published on 21st October 2015 in the West Sussex Gazette. The Horsham Museum and Art Gallery’s latest exhibition ‘Portraying the Poor and Industrious in the age of Waterloo’ seeks to tell the story of the rural and urban poor, and societies changing attitude towards them in the late 18th and early 19th centuries. The Industrial Revolution in Britain had seen a mass movement of people from the countryside to towns and cities across the country. There had been a long tradition amongst artists of depicting hawkers and the poor in urban settings. However, with increasing fears of revolution at home as well as on the Continent, artists began to draw and paint the rural poor. The timeless social order of the countryside seemed safe against the perceived threats of the urban poor. English print makers reproduced and distributed these images very successfully placing them in the nation’s consciousness. The 1790s saw two years of appalling harvests leading to starvation. Horsham had bread riots. Events like these led to the enclosure awards which were designed to enable efficiencies in farming. For example the Duke of Norfolk enclosed Horsham in 1813. But enclosure awards did not benefit everyone. Many of the people whose lives were bound up with agricultural land were profoundly affected. The Agricultural Depression continued after the Napoleonic Wars and the Battle of Waterloo of 1815 until 1836. Crushing taxation connected with the post-war national debt, a glut of workers returning from military service, and the subsequent collapse in food prices came with heavy social and economic costs. The depression’s severity brought financial ruin upon landlords and tenant farmers alike. Exhibition curator, Jeremy Knight, stands next to a colour mezzotint print titled ‘The Rapacious Steward or Unfortunate Tenant’ after William Redmore Bigg (1755-1828). In this scene a tenant farmer is being taken from his family as the steward looks upon their distress dispassionately. 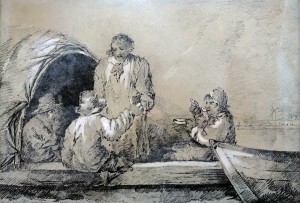 Jeremy Knight draws my attention to the charming sketch ‘A Fishing Trip’ by the artist George Morland (1763-1804). He comments “This sketch was almost certainly drawn on a visit to the Isle of Wight whilst the artist was avoiding his creditors in London”. Morland is well known for his rural landscapes, but he also painted coastal scenes like this one depicting fishermen and the poor. He employed a spirited technique producing a large body of work despite his own dissolute life which was often defined by drunkenness. The artist Thomas Rowlandson (1756-1827) knew George Morland well. Jeremy enthuses “Thomas Rowlandson is probably one of the best known illustrators and caricaturists of the Regency period. 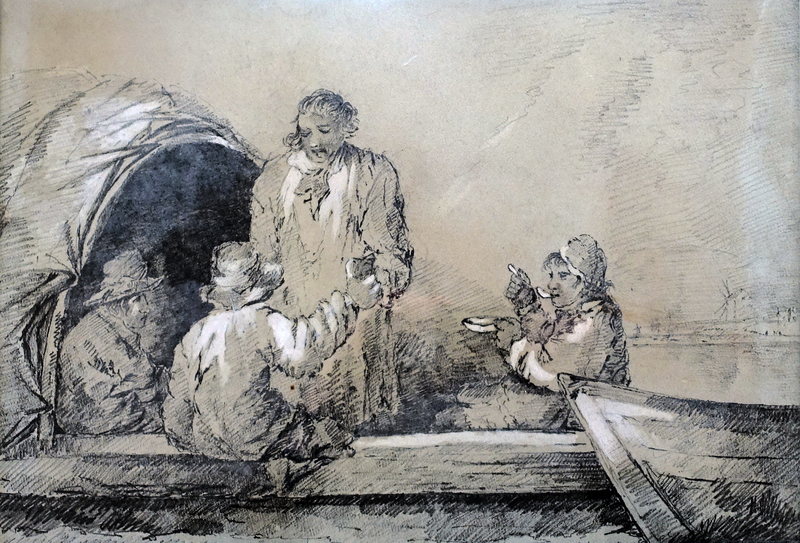 When depicting the poor he often draws our attention to the activity and not the actual portrait.” I comment on the charming watercolour ‘Girl feeding Pigs’ by Rowlandson and Jeremy replies “Pigs were very important to the poor. 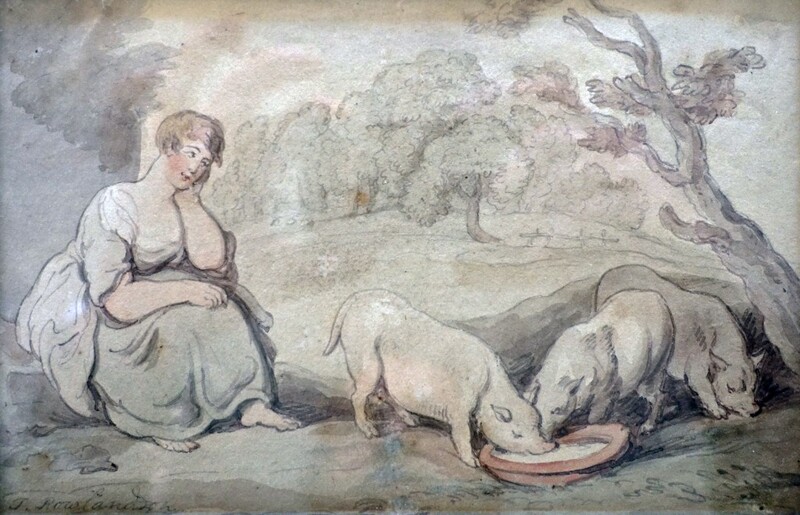 Morland kept pigs in his house and often painted them being fed. Who knows, perhaps Rowlandson might have painted this picture in jest thinking of his friend.” Certainly Rowlandson is famous for caricaturing people’s vanities, eccentricities and hypocrisy. These depictions provide a softened, romanticised view of the poor. A revival of the Church in England together with fears of revolution brought the plight of the poor to the public’s attention. Jeremy Knight has once again placed our local history in the context of British art and national events in this imaginative exhibition. He is deserving of our thanks. The majority of the works on display are from private collections and are rarely seen. I am so glad that Toovey’s is supporting this fine exhibition. Admission is free and there is much to delight the visitor! ‘Portraying the Poor and Industrious in the Age of Waterloo’ runs until 28th November 2015 at the Horsham Museum & Art Gallery, 9 Causeway, Horsham, West Sussex, RH12 1HE. For more information visit www.horshammuseum.org or telephone 01403 254959. By Revd. Rupert Toovey. Originally published on 14th October 2015 in the West Sussex Gazette. In the September of 1848 the Pre-Raphaelite Brotherhood was founded in London. Its principal members included the young painters John Everett Millais (1829-1896), Dante Gabrielle Rossetti (1822-1882), and William Holman Hunt (1827-1910). The Protestant Reformation of the sixteenth century had destroyed the rich tradition and iconography of Medieval and Renaissance Christian art in Britain. The young artists of the Pre-Raphaelite Brotherhood were aware that their contemporary culture lacked a strong tradition of religious art. They found themselves in sympathy with the Oxford Movement which was led by High Church members of the Church of England. Amidst some controversy it brought symbolism and vestments back into worship, and some Roman Catholic practices were re-introduced. The Pre-Raphaelite Brotherhood set out to place Christian subjects at the heart of their paintings. These pictures were not, however, intended solely for churches, but rather for public exhibition or private contemplation. Their expression of holiness breaking out into the world and into the everyday is something which has a particular resonance for myself and my calling. From its very beginnings Pre-Raphaelitism was characterised by an innovative style in reaction to the conventions of the Royal Academy. Indeed, Rossetti joined the Royal Academy School in 1844 but left, bored by the curriculum which he felt allowed little room for the imagination. The Pre-Raphaelites adopted a way of painting on a wet, white ground, imitating the ancient technique of fresco painting. Although slow and difficult it gifted their colours with brilliance and luminosity. They employed intense detail and depicted the natural likenesses of individual men and women as they sought to bring authenticity to their work. They often painted the landscape backgrounds of their pictures in the open air. It was whilst painting outdoors that John Everett Millais and his follower, Charles Allston Collins (1828-1873), met Thomas Combe. Combe had made a fortune printing Bibles for the University Press and he used his wealth in acts of philanthropy and in patronising these artists. Today his collection forms the basis of the Ashmolean Museum’s group of Pre-Raphaelite work. The Brotherhood’s work was savagely attacked in the press when it was exhibited at the Royal Academy in 1850 and 1851. The famous Victorian critic and artist, John Ruskin, wrote a letter in their defence to The Times in May 1851, saying that the Pre-Raphaelites ‘…will draw either what they see, or what they suppose might have been the actual facts of the scene they desire to represent, irrespective of any conventional rules of picture-making’. 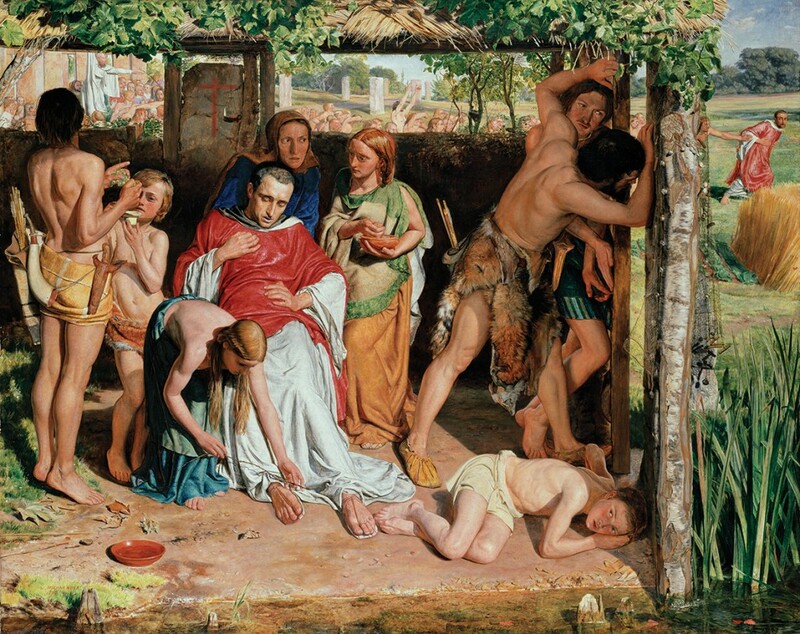 William Holman Hunt’s ‘A Converted British Family Sheltering a Christian Missionary from the persecution of the Druids’ was amongst those pictures strongly criticised in 1850. The painting portrays an act of mercy as a converted British Christian family hides a missionary wearing a red chasuble from the Druids. Beyond the depiction of a particular imagined scene the painting is filled with Christian symbolism. The converts hold a thorn branch, sponge and grapes, symbols of Christ’s death upon the cross and of Holy Communion. The bowl of water speaks of Baptism and the net refers to Jesus’ instruction to his Disciples to be fishers of men. Hunt depicts the humanizing effects of Christianity. The flowers in Charles Allston Collins’ ‘Convent Thoughts’ were painted in the garden of Thomas Combe. 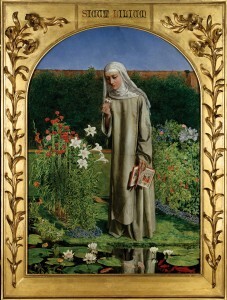 The nun in this enclosed garden contemplates a passion flower, an allegory of the Crucifixion. The book she holds open has depictions of Christ on the Cross, and the Annunciation, both painted from actual manuscripts. 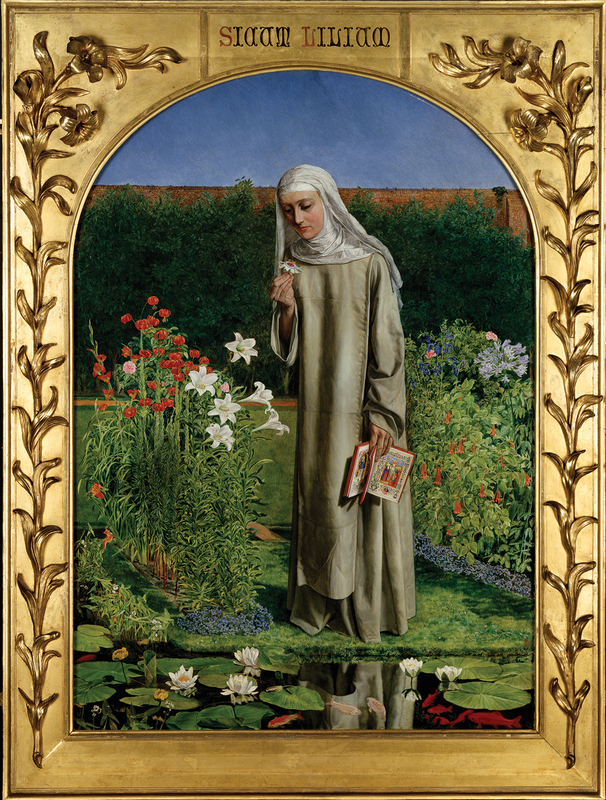 The lilies in the garden and on the frame symbolise the qualities of the Virgin Mary’s virtue. In all this the magnificence of sacrifice is portrayed. 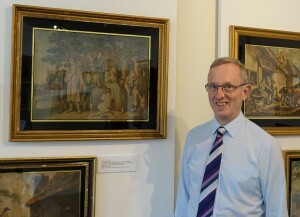 Both paintings were owned by Thomas Combe. Combe also owned a version by William Holman Hunt of ‘The Light of the World’, which he gifted to Keble College, Oxford. It can still be seen in the college chapel. This has been described as ‘a pivotal work’ in Hunt’s career and was perhaps the most famous Victorian painting in its time. The inspiration for the picture is said to have come to Hunt whilst he was reading the Book of Revelation in the Bible. The verse which caused this religious epiphany was “Behold’ I stand at the door, and knock: if any man hear my voice, and open the door, I will come in to him, and will sup with him, and he with me.” The version shown here is from a stained glass window designed by Hunt, at All Hallows, Tillington, Sussex. The light of Christ is depicted by the lamp which illumines his regal figure. The door has no handle; as Jesus offers invitation to us we are to respond with invitation to him. It is vital to our meeting with Christ. All Hallows, Tillington is under the care of the Revd. Bob Mitchell. Its wonderful array of stained glass windows inspire prayer and reflection. Bob and his congregation will be celebrating Harvest Festival at their family service this coming Sunday, 4th October 2015 at 11.15am. You are invited to join them. Bring some produce, groceries or a donation, and be inspired by ‘The Light of the World’. By Revd. Rupert Toovey. Originally published on 30th September 2015 in the West Sussex Gazette.